Sue Mees centre with the team. ‘Fish and chip babies’ are children born with nothing and often sent home wrapped in newspaper for warmth. Sue Mees, President of Browns Bay Rotary turned what started as a pastime into a project of hope and gathered up about 20 women from the Browns Bay Rotary and Torbay Probus Club and got them all behind the cause. “It’s 100 babies that are going to have an item of clothing. It’s just a drop in the ocean but it makes a difference” Mees says. 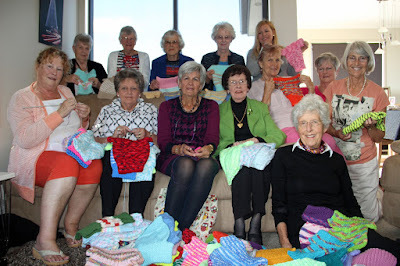 The women knit jumpers all using the same pattern and made up of bright colours.